Poor oral hygiene can accelerate the development of gum disease, but it is not the only way to get it. Other things such as genetics, gum disease can be caused by stress, poor diet, tobacco, and bruxism. Bruxism, or chronic teeth-grinding, puts a large amount of pressure on the gums, causing them to retreat. Damage can be reduced with the use of an appliance such as a mouthguard when sleeping. 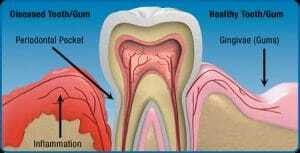 Are you curious about the health of your gums? By now, you should have a better understanding of what gum disease is and the truth about how to treat and prevent it. Even though the team at Vaught Orthodontics is in the business of straightening teeth and providing beautiful smiles, maintaining healthy gums is important. So see your dentist on a regular basis and if you have any questions please contact our Savannah or Richmond Hill GA office to schedule a complimentary initial consultation if you would like to learn more about getting a great smile.